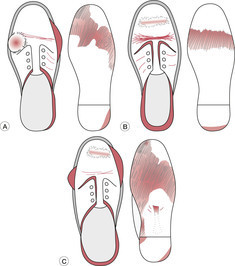 Figure 1: Shoe wear marks seen in cases of (A) chronic hallux limitus; (B) pes cavus; (C) pes plano valgus seeTable S5. This article was published in Neale's Disorders of the Foot, Lorimer, French, O'Donnell, Burrow, Wall, Copyright Elsevier, (2006). The design team (led by Water Creative, an entity of The Water Group, LLC) consulted with Taye about styling and fit; the result is the black & white model of the shoe called "The Highlight" (owing in part to the green-yellow color of the out-sole which reminds us of a highlight marker). Rubber from the out-sole is ground up and used to make soccer, football and baseball fields and weight room flooring. The ratchet-top closure snugs boot tops tight against the leg, and the Aerotrac out-sole features a bob design. Competitors' designs leave the mid-sole edge exposed, whereas Oakley's Nail raises the out-sole to encapsulate and protect the mid-sole.